High returns occur with high CAPE because prices get bid up too high or earnings finally collapse. After the CAPE maxes out the stock goes through a sideways period until valuations get reasonable again, then the returns can go up. The CAPE is high enough that I think we will see a lot more sideways return in the future 10-15 years. Now you told me VTSAX but you're showing me a chart of the S&P. Mainly because you can't easily get CAPE graphs. You're content to own the whole universe of stocks: US & non-US. The point is, if you had a graph of Europe up there the CAPE ratios would look much more attractive. So why worry about how many months/years the S&P has left in it when you can just allocate more $$ to non-US funds where the stocks have a lot more potential to rise. Note, many of the worst years for advance economies correspond to retirement starting in or around either WW1 or WW2. We forgot too easily how the US and North America was relatively spared the worst of the last century. (Or don't retire at the period that essentially marked the end of a global Empire, UK retirees in the 1900, looking at you). This dataset is more pessimistic than I choose to be, but it's helpful to remember the international experience. A small to moderate bond allocation, approximately 20%, has historically reduced volatility much more than it has decreased overall returns. Check efficient frontier. Once more, limited to historical data, and based on geography of your choosing. Exactly. The stock market is too high is not a valid argument. This has happened in the past and it will happen again. You can also utilise different portfolios although there is no free lunch in this regard. You are also not even really looking at the assumptions within the 4% rule. The 4% states you never receive another cent outside of your portfolio. This is bordering on ridiculous. In stating all of that if you are risk averse or you want to get rich (some people may actually like to have a large bank balance) then maybe you should keep working until you get to 3% or less or just keep working forever. None of these arguments though are rational statements against saving up to 25 times your expenses (assuming you judge your expenses accurately), investing in a sensible portfolio and being able to retire if you want too at that point. Personally I think 20 times your expenses will typically be fine depending on how old you are. Right, you're making a prediction about the future. That's market timing. You might think "but wait, I'm smarter than all those other people out there that are also trying to time the market, and I have better data and better insight, so I'll succeed where they all failed". I can assure you, this is not the case. I think people that get it wrong try and do too much analysis on micro level details and miss the big picture. The trick to doing well is to figure out a decent asset allocation/investment approach and stick to that consistently. All the micro data analysis misses the big picture and that big picture is that a diversified portfolio utilising the lowest possible fees in tandem with saving somewhere from 20-30 times your expenses should enable you to retire from a financial perspective and be relatively safe. You can't time the market and you can't develop better models than the trinity study based on some special factor that only you or other special people know. This whole field is about accepting that you aren't a special snowflake. You don't have special inside information. You are simply smart enough or humble enough to recognise that you will put the odds in your favour and accept the inherent risks within your approach because this is the best that anyone can do. Disgree. I'm not just talking about overvalued stocks, I am specifically noting that the CAPE ratio has only been over 30 three times in history: the great depression, and the rise and fall of the dot-com period. The rise of the dot-com period happened after the original 4% study and was too recent to be included in the 2009 update. As for the great depression, it was the single year where the 4% rule FAILED. Other than the great depression, the 4% withdrawal rate study has not experienced stocks at these valuation metrics, so I don't think it's safe to assume "business as usual"
How do you figure? Cfiresim seems to disagree with you. The 75/25 portfolio starting in 1929 and withdrawing 4% per year adjusted for inflation never depletes to zero. It is cut in half by 1933 but then starts growing again. Feel free to check my math, or provide a different data source. The 30 year CAGR starting in 1929 was over 11%. The 20 year CAGR was much worse, but still about 3.7%. Maybe you're confusing "portfolio failure" with "earns less than 4%"? Remember that your retirement account balances can always go down in any year, but as long as they don't go down to zero then your retirement hasn't failed because you can continue to draw your 4% inflation adjusted expenses every year. As for the great depression, it was the single year where the 4% rule FAILED. Well that's not true either. It didn't fail in 1929, and most of the actual 4% SWR failures in the historic record are in the 60s, due to stagflation in the 70s, while CAPE was very normal. Are you sure you're comfortable with this topic? Yes I'm aware of this (I know my flagrant comment about bonds is under fire) although I believe the utility curves of some investors could prevent them from having any bonds in their portfolio at all. This is an asset allocation question. I do have a tiny amount of bonds in my portfolio. Sorry I looked back at the article and realized I also needed to specify the 100% equity selection is where things failed. Things held together for a bond allocation of 25% or more. 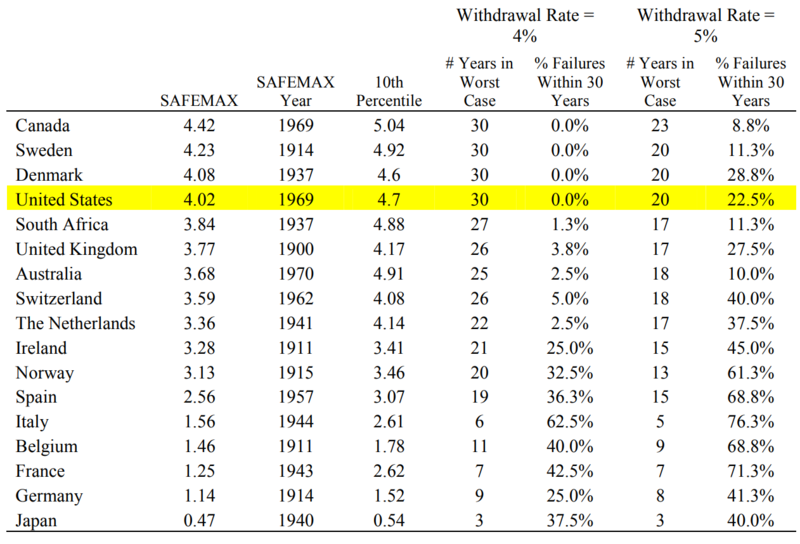 Some good news from the study; from 1946-1995 (when the CAPE never exceeded 25) it showed a 100% success rate for a 6% withdrawal rate for scenarios with at least a 25% equity allocation. That sort of blows my mind. A 6% withdrawal rate suggests that only 17x expenses might be needed for a 30-yr time frame, although to be fair I would have to have a lower CAPE before I started off on that journey. I'll readily admit, I need to catch up a bit on the 'runewell debates' above, however, I struggle with how the 4% rule fixes expenses at a level which might be artificially low. One thing I don't hear discussed much from ER's is how reliable that is if you ER at 30 or 40 that expenses don't increase. I can imagine, for the intended 55 or 65 yo demographic, there will be little or discretionary expense increase, but 30 yo ERs? Inflation is accounted for in the 4% rule. If you have kids, and want to help them with college or a car or whatever, you should factor that in to your savings amount. And I agree, healthcare is concerning. This is where we can agree. The best analysis that we can utilise is the 4% rule when it comes to estimating how much you need to retire. The biggest risk area is if you have inaccurately estimated your expenses. Estimating expenses is something that is also really hard because it's an individual thing. Do you use current expenses ? What if you intend to spend more via travelling if you RE ? What if you get bored and want to do a lot of stuff ? We use our current expenses but we have 3 kids with the 2 oldest finishing school soon (college/university will be free as we live in Australia) and we expect costs to go down over time. We won't travel unless we work or our portfolio allows us to travel. We also own our house in a HCOL area and we could easily downsize. Our buffers also include inheritance and social security. If you have 3 kids who are young and you intend to pay for them to go to an expensive college than your situation may be different. You may be single and retire but get married and have kids post retirement. This though doesn't invalidate the 4% rule. It just focuses on the area of highest risk. Dw and I are fortunate (financially speaking) to not have kids. We currently make $20k/year in rent from properties co-located with our house. While I love living in the USA, should healthcare costs start eating up all of our $20k in rent I think we will simply sell the house and move to a lower cost country. Lets face it, there are LOTs of choices in that regard (like all of them!). Of course the US will tax us on worldwide income so we are not completely off the hook, but tax treaties mean we can avoid double taxation fairly easily and we can keep all our Vanguard accounts in place to draw our chosen 3%. But even "inflation" can be considered a misleading indicator. I agree that technically CPI is included in the 4% rule, and if you aren't buying new iPhones and a Tesla, maybe that is a good enough benchmark, but it is a broad basket of goods and also makes value judgements for you about tangible cost discounted by added features. So I'd argue that a 30 and 40 y.o. experiences higher inflation (compounded if you are raising kids) than what the CPI reports. Of course, with the reported figure being so low for so long, Americans have been able to ignore this, but go to other countries where their prices in their local currency are 'outrageous'... We are very fortunate to enjoy a strong dollar and the benefits of importing cheap goods. While you're employed, your income generally rises with inflation and when you are collecting Social Security, that adjusts for COL, but ER'd folks are SOL :). I definitely agree with you that different folks personal inflation rates aren't always going to line up well with the CPI. In addition to the assumptions it makes that you brought up above, it also makes assumptions about how much of your spending is in different subcategories, each of which are experiencing dramatically different rates of inflation (for example education and healthcare prices are going up much faster than overall CPI inflation, while apparel and recreation prices are going much more slowly than the overall CPI). However, one issue that I think is often overlooked is that for folks who don't rent, whether they own a house outright or carry a mortgage in FIRE -- and please let us not reopen that obnoxious can of worms -- a very big component of their cost of living is experiencing no inflation at all. (Although property taxes, maintenance, and home insurance will still increase with inflation over time). This tends to drag personal inflation rates down below the overall CPI, and may, to some extent, balance out the biases dragging personal inflation higher than CPI that you identify above. But only to the extent you include these inflation-shielded housing costs as part of your "cost of living" in the first place, which virtually no one who owns their home free and clear would do (most people would simply treat the elimination of rental expense from their cost of living as exactly that, unless they're using some kind of funky imputed rent accounting), and which most informed mortgage-loan-carriers would not do without accounting for the inflation-protected nature of that cash flow item in their financial planning (for example, in my own accounting for my personal retirement planning, I deduct my outstanding mortgage loan balance from my investment portfolio to determine my stash size, and ignore the principal + interest payments when determining my expenses). I point this out only because your post feels like a step in the direction of the argument, commonly made in early retirement circles, that frugal mustachians are better-protected from inflation simply by virtue of their low expenses, which doesn't really hold water -- those low expenses (which presumably serve as the basis for determining the required stash size to support them in retirement) are just as subject to inflation as any others. I believe in international exposure in the AA as well, but by doing so you/we/me are moving away from the 4% rule analysis as no international was included so it becomes more apples and oranges. And in many developed countries SWR are well below the US 4%. Except that it is not at 18, it is at 26. The 18 is most likely a forward looking PE - ie expected earnings for the next 12 months / current price. That's part of the reason I'm saving up 30x expenses, and will have a paid off house before retiring - I want to have some cushion and flexibility if returns are depressed for an extended period. Right now, during saving/accumulation, we live a fairly frugal life on about $30k per year (not counting mortgage). I plan to save up enough to allow $60k per year during retirement. That's a very nice life, and we have the ability to cut back significantly if we need to. I like having that flexibility built in. Brooklynguy, good point. And I agree with you about the perils of the argument described in your second paragraph. Generally it seems that "luxury" items (electronics, entertainment, etc) are the items which have small or negative levels of inflation, while items that are necessities even to FIRE folks (like healthcare) show higher rates of inflation. Since folks who RE with budgets at or below the median household income are going to see their spending biased towards the second category of expenses, I agree that -- putting aside whatever is spend on having a place to live -- the average mustachian's expenses are more likely to inflate at or above the overall CPI rather than below it. Another reason why the 4% withdrawal rule seems dated. I would think that causing 1/3 of your portfolio to be international stocks would improve diversification. Some areas that had 100% success rates might change to 95% if the return is lower, but other instances of a 50% failure rate would probably go up significantly. I think the upside would be more attractive than the downside. But without a long history of international stock returns, it's going to be difficult finding an answer. There's no difference between selling appreciated stock and spending the dividends. With selling stock that's appreciated you have less of an ownership stake in the company, that's another difference. Unless your stash is pretty huge your % ownership stake will not change in a meaningful way since it will be tiny to begin with. Ah, thanks for the clarification. The 26 number would help explain runewell's CAPE number of 30 better. I don't pay all that much attention, obviously. This is exactly what I think people do wrong when discussing the 4% rule. It's micro analysis of the data and missing the key points. The trinity study is simply a study based upon historical data within the US market. It's a guideline not something that should be followed blindly. The key points of the trinity study are that saving 20-30 times your annual expenses should result in your stash lasting 30 years. When it comes to portfolio theory it should be as simple as stating that a diversified portfolio (across asset classes and within asset classes) is a good idea. It's also a good idea to utilise a stock heavy portfolio because the no 1 risk to portfolio failure tends to be inflation which stocks protect against. Based on these points a portfolio of 50/50 through to 90/10 (international stocks/domestic bonds) that is 20-30 times your annual expenses means that you have placed yourself in a statistically likely position for your retirement to be a success from a financial perspective. That is the best that you are going to get. Trying to mimic the best past performance or protect yourself perfectly is not possible as we can't predict the future. The past can only offer broad general principles to follow. It can't offer completely detailed mathematically exact criteria to follow. • Early retirees who anticipate long payout periods should plan on lower withdrawal rates. higher consumption. Most retirees would likely benefit from allocating at least 50% to common stocks. that include withdrawal rates greater than 4%. actuarially determined life expectancy, so it is wise to be conservative and add a few years. A multiplier of 20 would correspond to a withdrawal rate of 5% and under the inflation-adjustment scenario there are a lot of instances where that fails. How do you figure? Cfiresim seems to disagree with you. A 3% withdrawal rate was pretty darn safe. At a 5% withdrawal rate, the 15-yr portfolios were 100% safe but longer time periods were never more than 90% safe, sometimes considerably less. Also keep in mind that on the default settings Cfiresim's latest simulation period is approximately 1987-2016. More recent instances of 30-yr scenarios starting at 25+ CAPE ratios aren't really possible simulate because the data doesn't exist yet, but we know they're coming. Also remember that if Cfiresim is updated with new information, eventually the dot-com boom and the financial crisis are likely to add more examples of failure to the simulations. And success. One of the things I got from the trinity study was that even the worst market downturns tend to be only for a year or two, and really don't make much difference to you (if you have some bonds, a 3 year cash supply or any other means of support while markets rally). The examples of failure you mention fall well within these parameters, and I would be surprised if they made much of a blip on the simulations. “Because interest rates are so low now, while stock markets are also very highly valued, we are in uncharted waters in terms of the conditions at the start of retirement and knowing whether the 4 percent rule can work in those cases,” said Wade Pfau [the guy who updated the Trinity study], a professor of retirement income at the American College of Financial Services and another researcher within the financial planning community. said Wade Pfau [the guy who updated the Trinity study], a professor of retirement income at the American College of Financial Services and another researcher within the financial planning community. lol, you must be new here. We all know who Wade is. He's even posted to the forum before. You probably need to stop thinking of the forum as a bunch of know-nothing amateurs. I would argue that there is more expertise on this topic here than anywhere else on the internet, including wade's site or bogleheads. This is crowdsourcing at its best. Actually that's just people's interpretation of the study conclusions. Even though it seems like an appropriate corollary, the study never actually mentions anything about multiplying by the desired annual amount before inflation adjustments by the reciprocal of the withdrawal rate. The statement that I made is broad because that is the best way to draw conclusions from historical analysis. It's like coming up with a detailed trading plan that analyses micro point to the nth degree. Those nth degree details will more than likely not hold in the future. When you start drawing down to much into the detail unless you have the ability to recognise that the future will be different to the past you will probably miss the key points. I agree with the points that are made above excluding the comment related to 5% failure rates. This is another key point in the Trinity study that needs to be recognised and has already been mentioned on this thread multiple times. The assumptions within the Trinity study are basically ridiculous. When you start taking into account factors such as social security/inheritance/the ability to go back to work the picture changes significantly. We can run a 20 year simulation at a 5% withdrawal rate starting in 1997 (the year after Greenspan's "irrational exuberance" comment). Using $1MM starting portfolio, a $50k spend, and leaving everything else at the default values, the 1997 start year simulation ends with about $1.1MM. Granted, US stocks still had three banner years ahead of them at the beginning of 1997, so I would expect a sim starting in 1999 to have very different results. But the point is, while high valuations may indicate higher risk, they don't necessarily indicate impending failure. What's interesting about this simulation is that we get "only" a 92% success rate, with almost all of the failure years starting in the late 1960s (1906 being the odd exception). So once again, it appears that very high inflation/low growth environment seems to be the most toxic scenario. 1929 and 1937 came close to running out, but not quite. No, we don't all know who Wade is. I didn't know who Wade was. Other people new to the forum probably won't know who he is. The hostility and comments I have experienced so far don't give me a lot of confidence, although a few posters do seem to have some good contributions. Just because I am new here doesn't mean you have to emit a condescending attitude. Frankly I was hoping to get more constructive criticism on my "add caution to the 4% due to this CAPE article" and I got some feedback but it sounded like most people didn't want to hear anything that would challenge the established 4% motto. An inheritance or returning to work and probably not scenarios the majority of people want to rely on upon retirement. If you plan on a work-free retirement and later find yourself working, you might as well consider the 4% rule a failure. Social Security could probably be treated as a monthly certainly which could be subtracted from your monthly retirement needs. It could be troublesome to factor in SS inflation or viability. 53-83% failure rates with 0% stocks. This is correct, but we can certainly look at how more recent retirement scenarios are doing already, and compare them to the patterns of the existing worst 30 year intervals on record. A couple of years Kitces did just that for hypothetical retirees who pulled the trigger in 2000 and 2008, after the two more recent crashes and compared the performance of these portfolios so far to how things were looking for retirees in 1929, 1935, and 1966 (some of the worst years to retire in historically) after the same length of time. This isn't ideal, but it does a good job of harvesting some information we do have about more recent retirements, rather than pretending we have absolutely no idea what the outcome for the 1987-2017 retiree will look like until January 1st 2018. The bottom line, though, is simply to recognize that even market scenarios like the tech crash in 2000 or the financial crisis of 2008 are not ones that will likely breach the 4% safe withdrawal rate, but merely examples of bad market declines for which the 4% rule was created. In turn, this is an implicit acknowledgement of just how conservative the 4% rule actually is, and how horrible the historical market returns really were that created it. In the end, this doesn’t necessarily mean that the 4% rule is ‘sacred’ and that some future market disaster couldn’t be bad enough to undermine it ... But when the Great Depression and the stagflationary 1970s couldn’t break it, and the crash of 1987 and even the global financial crisis of 2008 were just speed bumps, it will take a lot to set a new safe withdrawal rate below 4%! I've previously pointed out a number of reasons why you're getting a much less receptive response than other folks (with lower post counts than you) who have also discussed potential issues or oversights in the 4% rule, but who have received much more positive feedback from the forum generally and many of the same posters. Similarly to how you're trying to get feedback without then seriously considering the flaws people are identifying with the CAPE analysis approach, you are also continuing to complain about receiving a hostile/condescending response despite having a clear explanation of why it is happening, and positive models for how to engage in discussion of the same topic without eliciting such a response. Thanks for directing me to that. I scanned it but shall have to revisit it again. He concluded that today's high valuations are a concern and hopes that since under normal valuations a ton of scenarios leave zillions unspent, that this safety margin will prevent a lackluster return period from wreaking havoc. My point all along is to recognize the high valuations and introduce other research that shows we would be wise to project gloomy investment returns going forward. No, we don't all know who Wade is. I didn't know who Wade was. You might find it instructive to take a spin through the previous pages of this very thread. Wade's research has come up a number of times, not to mention the broader topic of today's high stock market valuation/low interest rate environment's possible implications for future safe withdrawal rates. Oh, that "hostility" is the reaction to your cocky-ignorant-know-it-all attitude. We've tread all this ground before, it's all available to you to get up to speed - and there is even a search function. He doesn't even need to search. If he just read the thread we're current posting in, and some of the links it contains, he wouldn't have to repeat the same tired misconceptions over and over again. Hrm... I don't think the current line of conversation will result in anything constructive. Yes, you've caught me. I am a brand new to the internet. Please, oh wise and benevolent mustachian OG, set me straight. Do your simulations account for the fact that a chunk of your equities should be in international markets? Or is the simulated number based only on US returns. And if that is the case, how does that affect any X% withdrawal assumption. Dude, just read the thread already. All of your questions will be answered. It was created specifically for people like you. The Dimson, Marsh, and Staunton dataset does have that type of historical performance data for 20 plus countries that have accounted for the vast majority of world equity valuations for the past century, so someone who had access to it could run this test. Instead it seems to only get used whenever some idiot wants to write another "the 4% rule doesn't work in countries other than the USA" article about the groundbreaking finding that the 4% rule would not have protected retirees while whose entire countries were leveled to the ground during world war II. *And the concern even if there were is that global markets are more integrated now than in the past, so the performance of US, German, and Brazilian stock market indices are likely more correlated than historical data would indicate, meaning we may well get less of a reduction in volatility from international investing than historical data would show, giving folks a false sense of security.